Old wine, new bottle, spilled blood: The DTC attempts to re-invent a Greek tragedy – with headphones, candles and an impressive view of Dallas at night. 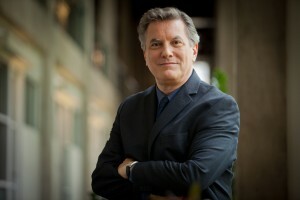 Kevin Moriarty aims to revitalize, re-ritualize ancient Greek tragedy for a digital-age Dallas. 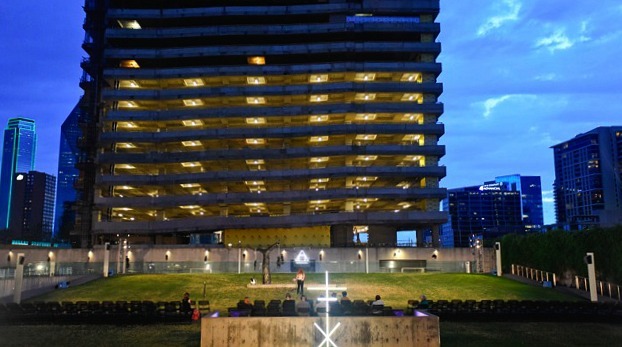 ‘Electra’ presented by the Dallas Theater Center through May 21st in Annette Strauss Square. What director wouldn’t? With his ‘free adaptation’ of ‘Electra,’ the artistic director of the Dallas Theater Center hopes to invest the ancient tragedy with the kind of mythic, civic and emotional grandeur and force it once held. This is not a trendy revival of Sophocles’ tale of justice and family revenge set in some spare, avant-garde white box with brooding dance music. Moriarty took the inventive gamble of staging ‘Electra’ outdoors in the heart of the Arts District. Surrounded by skyscrapers and art palaces, this might well make for a modern equivalent to what the Athenians would have seen when the tragedy was originally staged. On the slope of the Acropolis at the open-air Theater of Dionysus, their city was laid out in front of them. To be sure, Moriarty has added modern dress and an electronic update: Audience members wear wireless headphones as we move from site to site in and around Annette Strauss Square. We hear not just the onstage characters; we listen to the spirit of King Agamemnon (Alex Organ) who performs the function here of the Greek chorus, bemoaning, beseeching, blessing. Moriarty sees himself as a ‘big idea’ director, and this entire interactive, site-specific, city-at-night staging is a little like PunchDrunk’s immersive ‘Macbeth,’ the one called ‘Sleep No More.’ It’s the kind of large-scale gesture and technical challenge Moriarty’s drawn to – akin to turning the Wyly Theatre into a football field for ‘Colossal.’ Or sending theatergoers off in bump-em cars in ‘The Wiz’ to toodle along the Yellow Brick Road. Outdoor, immersive theater on this scale is an ambitious experience. Knowing the bureaucratic hurdles and wrangling restrictions the Meyerson Symphony Center and the AT&T PAC must have thrown at anything this unconventional, some serious plaudits are in order. It’s a striking, technically complex but spitting, sputtering, clunky effort. Moriarty clearly wants to Say Something Profound About the State of Dallas in a Tragic, Ceremonial Form. Good for him. But to give one example that may spoil the ending for you: The director reverses the Greek tradition of keeping the violence entirely offstage. Towards the end, he confines the audience inside the Annette Strauss Square’s bunker-like support room. It lends the final murders a face-to-face intimacy. We’ve slowly declined from the wide-open, grass-lined amphitheater down into this narrow, utilitarian, concrete tunnel to witness some bitter bloodshed. In effect, we’ve gone ‘backstage’ to see what the Greeks never did. Then we all walk back outside – in single-file – to the Winspear’s black, reflecting pool to perform a toro nagashi. That’s the Japanese ceremony of floating paper lanterns downstream to help guide ancestral souls to the afterlife. With a cool evening, with audience members encircling the dark pond and placing (battery-powered) candles on its mirror-flat surface, the entire event – from procession to contemplation – makes for an undeniably shimmering moment. That is, if you don’t mind being herded around by an army of ushers. You also might want to ignore much of what’s being said on the headphones. True serenity, it seems, proves elusive. Annette Strauss Square, facing the unfinished 1900 Pearl tower. All photos: Karen Almond. The fact is it’s difficult to invent a new ritual, a set of meaningful words and gestures that have the heart-cracking impact of catharsis. Think of political conventions with all their pre-ordained balloon-drops, all the accompanying punditry and video fireworks. These are, indeed, rituals – repeated actions intended to make a statement, to celebrate and elevate, to make the spoken words manifestly real. But it takes a rare convergence of rhetoric, events and a political leader to achieve anything like that. Mostly, we just sigh, roll our eyes or change the channel. In the theater, rituals are like re-enacted, collective memories. They pull us into shared meanings, they transport those meanings from the past to our present. Offhand, I can’t think of any that are battery-powered. Seriously, there’s little in our contemporary, touch-screen culture with any legendary narrative so core to us, so solemn that it could provide an equivalent to the tragedy of the House of Atreus. Perhaps our Civil War and civil rights struggle. Or maybe ‘Star Wars.’ For the Athenians, this epic was the whole ball of wax, not simply a family brawl re-enacted as entertainment. It was military history elevated to national religion and origin myth, it was ethical philosophy and municipal politics debated and brutally fought over onstage. It was, of course, a familiar story. The Trojan War, Part III: The Post-Traumatic Family. When King Agamemnon returned to Mycenae after defeating Troy, his wife Clytemnestra murdered him to live with her lover, the usurper Aegisthus. For years, daughter Electra – the primal resentful teenager – has vowed to avenge her father’s murder and now learns her brother Orestes – whom everyone thought was dead – has finally come home with retribution on his mind as well. Sophocles wrote his version in the shadow of Aeschylus’ ‘Oresteia’ trilogy, performed some 40 years earlier and even then considered by the Greeks to be one of their lasting, literary monuments. Quite the precedent to go up against. What Sophocles brought to Aeschylus’ story was his famous austerity and psychological insight. He honed the myth down by creating relentlessly driven characters with a fury for justice. He sharpened the stakes, especially in the great face-off between Electra (Abbey Siegworth) and Clytemnestra (Sally Nystuen Vahle). Aeschylus had granted Clytemnestra something of a fair case by stressing her husband’s killing of their daughter Iphigenia. Agamemnon had sacrificed her to the goddess Artemis to let the Greek army finally set sail for Troy. ‘Artemis must have blood! Obey, obey or a heavy doom will crush thee … Law is law!’ as Calchas, the seer, cries in Aeschylus’ version. Agamemnon chose his brother’s grievance about losing Helen, plus his own need not to lose face in front of his soldiers and, of course, the prospect of military glory – Agamemnon chose all these over his young daughter’s life. It’s much the same choice parents make when we send our children to war: We sacrifice them. But Clytemnestra’s accusation of her husband’s calculated, cost-benefit murder makes her less an adulterous back-stabber. It balances the mother-daughter argument more, tipping it back and forth like a vicious cross-examination. So – how does one honorably disentangle justice from revenge and family grudges? Electra eventually doesn’t give a damn: She declares outright she’s more than willing to use evil to counteract evil. And that’s one of the things Sophocles adds, a typical character of his: Electra is the daughter who wasn’t killed, the ferocious daughter, the daughter willing to defy the accepted order (going up against her mother, the queen, rather than the father who would have sacrificed her as well). She does this while also being daddy’s little girl – his purifying sword. But while Moriarty is an ‘idea’ director, he’s not proven himself a particularly effective ‘actor’s director.’ With strong women, he basically sets them on ‘Take No Prisoners, Level 14’ and never has them downshift into anything more subtle. His forays into Greek dramas are prime exhibits. In his remarkably torrid, muscular version of ‘Oedipus el Rey,’ Sabina Zuniga Varela (playing Queen Jocasta) had the opportunity, at least, to take a break from all her gangland machisma to unveil a needy, lonely, mature woman. 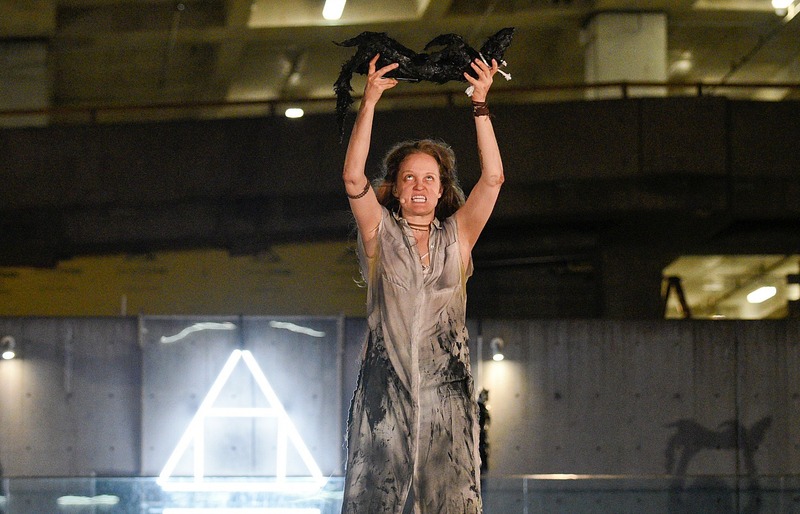 In his unattractive but undeniably fierce ‘Medea,’ Sally Nystuen Vahle played the title character as a walking blunt-force trauma. She does much the same here against Siegworth. Non-stop rage and resentment are wearying for people to watch and listen to (much less perform), and Sophocles knows this. It’s why both his Chorus and Electra’s sister Chrysothemis (an appealing Tiana Kaye Johnson) provide voices of caution and common sense. It’s also why some of Siegworth’s most affecting moments come when Electra opens up with tender disbelief because Orestes (Yusef Seevers) has seemingly come back from the dead. At last, we all can take a breather. Ditto with the ruse that Paedagogus, Orestes’ loyal servant, spins out about Orestes’ purported demise. All the shouting stops, and we get this gripping cinematic action sequence, as actor David Coffee vividly recounts a neck-and-neck chariot race to the death. Otherwise, it’s as if all Moriarty can do is try to find new outlets for these characters to let the rage rip. At one point, he has Siegworth attack a trash can. OK. She’s a heroic, Sophoclean woman: We half-expect her to heave it across the lawn like a professional wrestler. Or stomp on it like a beer can. Instead, she plucks out a few crumpled wrappers and strews them about. Perhaps Moriarty wants us to see Electra’s long-searing grief as fundamentally childish or ineffectual – because that’s what this looks like: a tantrum. The director and his actors probably felt the need to fill up that football-field-sized lawn with some big, arm-flinging emotions. The smaller, more enclosed scenes at beginning and end are the effective ones. 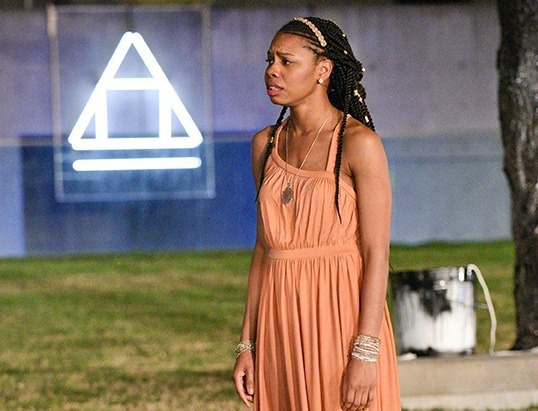 Brilliantly, Diggle, the scene designer, has created brutalist-concrete walls and white-neon abstractions that evoke Sophocles’ rock-hard style and the sun-baked Mediterranean setting – as well as the Arts District’s own bone-dry mordernism. 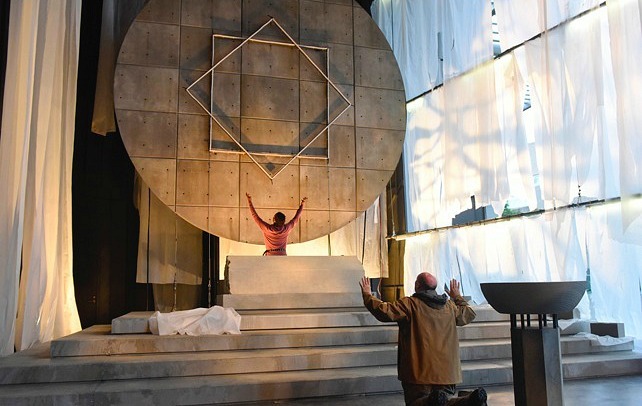 Diggle’s sharp slabs are as clean as a Louis Kahn masterwork and as primal as an old stone temple – especially in the first scene at Agamemnon’s tomb, which looks as though the whole thing was simply trucked over from the lobby of the Meyerson Symphony Center. Along with Broken Chord’s ominous but restrained musical underscoring on our headphones, Diggle’s stark designs make this ‘Electra’ open with a hard beauty and a chilly awe. The music and the sets are the production’s strongest, shrewdest design elements. And then there’s the ‘wow’ factor of Dallas itself, the cityscape lit up at night. With this ‘Electra,’ Moriarty’s main shot at contemporary relevance and civic significance is his fundamental staging tactic: He uses the entire Strauss Square and the city skyline to make this ancient story happen right here. If you wish to Uber over there, it’s across the street from Stephan Pyles’ Flora Street Cafe. What could be more Dallas? So let’s consider the city surroundings and what they say, however unintended or ironic. We enter the amphitheater by walking past a small shrine to one of our local deities: a white Lexus GS Turbo with the FSport package. Lexus, of course, is a major sponsor of the AT&T Performing Arts Center and therefore can’t be avoided. It’s hardly Moriarty’s choice that it’s here. Still, he knew it was and directs us there. In ancient Greece, it was common for homes to have a small statue of a good-luck god near the entrance. And this automotive product placement is impressive, a display fit for a palace. The car is elevated on a beautifully lit, angled platform, the better for our inspection and adoration. I felt remiss. A bad omen: I’d not brought Lexus-Dionysus an offering. As we enter the amphitheater, we can see, across the Woodall Rogers Freeway, the outline and lights of that sacred American temple, the Federal Reserve Bank. And during the performance, when Electra occasionally shouts a curse to the heavens or in the general direction of her mother’s house, Siegworth seems to aim it at 1900 Pearl, the unfinished tower that looms over the entire drama. It’s a skyscraper that a number of Arts District fans hate for blocking a major view of the Meyerson, for crowding in on Strauss Square’s own little bit of airiness and for adding yet another blue-glass, office building to a downtown that doesn’t really need more. To them, it embodies much of what went wrong with the Arts District and what’s still wrong with Dallas’ urban development priorities. So there’s a long waiting line of theatergoers willing to join Electra in heaping curses upon 1900 Pearl. I’m not simply having fun mocking things here. I have to believe Moriarty is well aware of how spectacular this view is, what it lends ‘Electra’ with its wide display of wealth, commercial energy and aesthetic sterility. He’s gone to all the logistical troubles of rain dates and headphones and ushers to stage ‘Electra’ like this – in a location that shouts Here is Dallas in All Its Ambitions and Flaws. Tiana Kaye Johnson as the more cautious sister, Chrysothemis. In David Grene’s translation of ‘Electra,’ Orestes expressly states at his father’s tomb that he’s come to purify and restore his home country. Greek tragedies established the trope of opening with a city that’s unwell, troubled, burdened. Recall the plague that opens “Oedipus Rex.” The palace stands in for the entire citizenry. It’s a metaphor that runs through Shakespeare (“Something’s rotten in the state of Denmark”) to Ibsen, Chekhov and Shaw (“This soul’s prison we call England. She will strike and sink and split”). But while Moriarity has gone to all this trouble to place ‘Electra’ practically in our town square, I’m not sure what, if anything, he wants to say about the State of Downtown Dallas – other than it makes for a splendid theatrical backdrop. Perhaps that the town needs healing. What town doesn’t? But what kind of healing? From what kind of illness? Any healing that Sophocles’ tragedies offer is a remedy of an especially scarring kind. When we come to the final killings that will purify the House of Atreus, Electra dreams of an axe felling a tree. Agamemnon was murdered with an axe, and Aeschylus specifies Orestes uses a battle axe against both Aegisthus (Tyrees Allen) and Clytemnestra. (Indeed, facing off against her son, Clytemnestra calls out for her own battle axe — way to go, Mom). But staging two axe murders in full view of an audience crowded into a room is not an easy bit of fight choreography to pull off convincingly. Limbs will need to be lost. Instead, Seevers uses a dagger. Which is a little disappointing. All this build-up, all this howling at each other about bloody murder, and we get a couple of minor, back-alley stabbings. But Moriarty seems to want this anti-climactic feel. The evil couple ends up as just another pair of corpses, heaped on the ground in the corner. So it goes. Sic semper tyrannis. They look like trash about to be put out for pick-up. And as you now know, this isn’t the ending-ending. Moriarty has – he hopes – a more peaceful resolution in mind. During the killings, a second disappointment comes when Siegworth – having shouted for most of an hour making her Electra an almost repellent instrument of rage and resentment – Siegworth speeds past perhaps the two most blood-curdling words in all of Greek drama. Imagine: As was the tradition, Clytemnestra runs offstage as Orestes heads after her to kill her. The Athenian theatergoers can’t see her but they can hear her screams, hear Orestes’ battle axe smash her. The queen cries out for pity. Electra shouts back: “You had none for him! Nor for his father!” And she watches what’s happening offstage, what the audience can only imagine. Now that’s some murderous hatred. We’ve gone from Righteous Womanhood to something more than a little unhinged. I bring up the butchery because it took Aeschylus three full plays to work out all his issues with justifiable regicide and with the Furies, the primordial gods crying for vengeance. Ultimately, he opts in favor of Athens’ trial-by-jury as a divinely ordained solution. ‘Perfected.’ Quite the claim for a screaming double homicide. There’s Sophocles’ austerity for you. When all the killing’s done, he declares, that’s it. History’s over. We’ve cauterized the wound. This house is cleansed. You may exit on the right. But Moriarty lacks that kind of austerity. He doesn’t like bleak or blank endings. If there’s horror and death, they can’t be pointless. They must come with social or spiritual consolation – not the desolation of a clean slate or the soul-shattering recognition of what it takes to be free of the past (he’ll never touch Samuel Beckett or Martin McDonagh.) So he doesn’t leave this anguished ending alone. We head out on our candle-lit procession and we wend our way to an attempted sense of, well, tranquility is far too strong a word. Resolution, maybe. The feeling that all the shouting and stabbing were probably worth it and everyone’s going to come out A-OK. Somehow. As we parade outside, we hear Alex Organ as Agamemnon relate the characters’ different futures: what happened to Orestes, what happened to Electra, which character got married, who went into real estate. It’s like those ‘whatever happened to’ summaries during the end credits of a movie, suggesting a sequel. But then we hear Agamemnon’s ‘favorite story’ about all this: Iphigenia was never sacrificed in the first place. (This is, in fact, a variant Greek myth originating in Homer.) The goddess Artemis rescued her and replaced her with a deer. A lovely thought. But it makes nonsense of what’s preceded it here. First, if Iphigenia was never killed and a deer was sacrificed in her stead, wouldn’t Agamemnon know? Wasn’t he there, stabbing deer or daughter? Or is this a case of Schrodinger’s daughter being dead/not dead? And if we take the replacement story as fact, it means the king never slaughtered his daughter. So there goes Clytemnestra’s justification for killing her husband (well, there was also Agamemnon bringing home his consort, Cassandra). But Iphigenia’s sacrificial murder was also one of Orestes’ reasons for seeking vengeance against his mother. So – no revenge, no real tragedy. You may exit on the right. We’re left with a disjointed production, an ushered promenade around Strauss Square, above ground and below, onstage and off. For what it’s worth, we do undergo an ambitious, participatory theater experience with some splendid scenery and some over-the-top performances. All of which, by the end, doesn’t provide us a city-wide catharsis. But then – who gets one of those these days?